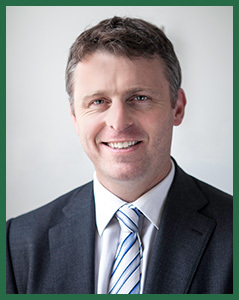 Simon is an experienced orthopaedic surgeon specialising in the treatment of knee problems. 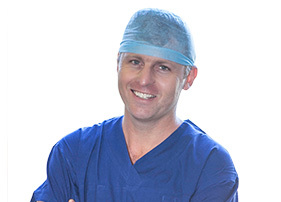 He completed his medical degree from Otago Medical School in New Zealand in 1994, and his specialty training as an orthopaedic surgeon from the Royal Australasian College of Surgeons in 2004. In 2006 and 2007 he undertook additional training in knee surgery in Melbourne (with John Bartlett and Hayden Morris) and Belgium (with Jan Victor and Johannes Bellemans). Since 2007, Simon has consulted at Suite 1/210 Burgundy St in Heidelberg. He shared the rooms initially with Mr John Bartlett. In 2014, Mr Bartlett retired from clinical work and handed over the ongoing care of his patients to Simon. Simon is also committed to his public appointment at Western Health, working at Western, Williamstown and Sunshine hospitals. In public he specialises in complex knee revision surgery and the reconstruction of traumatic knee injuries. He places particular emphasis on the importance of open and honest communication between himself and his patients. Clinic appointments are spaced to allow time to talk about all available options while minimising the chance of keeping patients waiting. The majority of his practice involves the treatment of knee injuries and arthritis affecting the knees. If surgery is required, it will be performed at Warringal Private Hospital. Warringal is a fully-equipped hospital including an intensive care unit. My anaesthetists and surgical assistants are all highly-trained and experienced. I use the latest equipment, techniques and technology. Simon bases his work on the highest professional and ethical standards. He is a member of several professional organisations including the Royal Australasian College of Surgeons, the Australian Orthopaedic Association, the Asia Pacific Orthopaedic Association and the Australian Institute for Musculoskeletal Science. Simon is a frequent speaker at national and international conferences. He has a strong interest in research as a way of both constantly auditing and improving results and a way of contributing to future advances in orthopaedic surgery. Current research projects are focused on improving the positioning of knee replacements with individualised three-dimensional planning, medial pivot knee replacements and measuring patient function after knee replacement. Mr. Simon Talbot finished his specialist orthopaedic training in 2004. Simon then undertook further training in knee surgery with fellowships in Melbourne (with John Bartlett and Hayden Morris) and Belgium. When John Bartlett retired, he handed over the ongoing care of his patients to Simon. Simon performs surgery on a wide range of knee conditions including arthroscopic surgery, cruciate ligament reconstruction, patella stabilisations and knee joint replacement surgery. He performs over 500 knee operations each year, including more than 200 knee replacements and 100 ACL reconstructions. Bilateral peroneal compartment syndrome after horse riding. Am J Emerg Med2009 Sep;27(7): 901.e3-5. Use of a New High-Activity Arthroplasty Score to Assess Function of Young Patients with Total Hip or Knee Arthroplasty. The Journal of Arthroplasty. Vol 25, Issue 2, February 2010, Pages 268–273. The Anterior Surface of the Femur as a New Landmark for Femoral Component Rotation in Total Knee Arthroplasty. Knee Surgery, Sports Traumatology, Arthroscopy. March 2008, Volume 16, Issue 3, pp 258-262. NZOA 2003: Six to eleven-year follow-up of 151 THR using ABG1 femoral stems. Development of a patient outcomes measure to assess the results of hip and knee replacement in highly functioning young patients. The resulting HAAS (High Activity Arthroplasty Score) has been translated into four languages. Improvement of the accuracy of positioning of knee replacements. Identified an error in the prior techniques for judging the rotational position of the femoral component of knee replacements. Developed Sulcus Line technique for measuring the position more accurately during surgery. The associated device has been patented and is in production (http://www.enztec.com/enztec-orthopaedic-instruments/knee-solutions/stag/). This has led to multiple publications and presentations and improved the accuracy of surgeons performing knee replacement. Currently assessing the clinical results from a large trial using a new generation of knee replacements known as medial pivot knees. 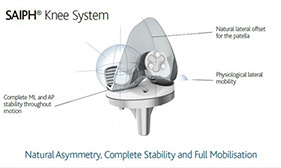 The results are showing improved knee stability compared to previous designs and higher rates of patient satisfaction. Total knee replacement instrument design and assessment. Provided surgeon consultation to Advanced Surgical Design and Manufacture (ASDM, Sydney) in production of a completely new instrument set for the Active knee replacement.